Note: FitEyes would like to thank Dr Robert Ritch for providing the source document for this article. 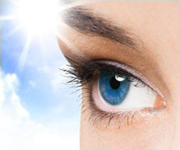 What is Argon Laser Peripheral Iridoplasty (ALPI)? Argon laser peripheral iridoplasty (ALPI) is a simple and effective means of opening an appositionally closed angle in situations in which laser iridotomy either cannot be performed or does not eliminate appositional closure because mechanisms other than pupillary block are present. It consists of placing contraction burns (long duration, low power, and large spot size) in the iris periphery to contract the stroma at the site of the burn, physically pulling open the angle (Figure 1).1-5 ALPI is useful in reversing an attack of acute angle-closure (AAC), either as an initial measure or when antiglaucoma medications fail. The diagnostic indications for ALPI require the ability to differentiate subtle gonioscopic findings. The examiner must be facile with darkroom indentation gonioscopy and with the anatomic causes of angle-closure and the means of diagnosing these clinically. Figure 1. Ultrasound biomicroscopic (UBM) images illustrating how ALPI contracts the peripheral iris stroma, creating a space between the anterior iris surface and the trabecular meshwork, thus opening the angle. Appositionally closed angle in an eye with plateau iris syndrome. Krasnov was the first to attempt to use laser burns near the iris root to separate iris and trabecular meshwork. The initial procedure encompassed only 90° of the angle. The laser parameters used in these early attempts were more like penetrating burns than the slow contraction burns which later proved optimal, and were often unsuccessful because of insufficient retraction of the iris from the meshwork. Kimbrough et al described a technique for direct treatment of 360° of the peripheral iris through a gonioscopy lens, and termed the procedure gonioplasty. Summaries of the indications and contraindications for ALPI. Laser peripheral iridotomy (LPI) is the definitive treatment for acute angle-closure in order to eliminate any component of pupillary block, even if other mechanisms are present or predominate. An attack of AAC that is unresponsive to medical therapy and in which corneal edema, a shallow anterior chamber, or marked inflammation precludes immediate iridotomy, or an attack which is unresponsive despite successful iris penetration by iridotomy, may be broken with ALPI. Circumferential treatment of the iris opens the angle in those areas in which there are no peripheral anterior synechiae (PAS). Since ALPI does not eliminate pupillary block, LPI is still required once IOP is controlled and the cornea has cleared sufficiently. All published series have reported virtually 100% success. In a prospective study of 10 eyes with medically unbreakable attacks lasting 2-5 days, mean prelaser IOP was 54.9 mmHg and 2-4 hours postlaser was 18.9 mmHg. Even when extensive PAS are present, the IOP is usually normalized within an hour or two. The effect lasts sufficiently long for the cornea and anterior chamber to clear so that iridotomy can be performed. ALPI may also be used as initial therapy in eyes with AAC, either with or without preliminary medical treatment. Immediate ALPI for acute attacks after initial treatment with 4% pilocarpine and 0.5% timolol has been reported successful when given over both 180 degrees16 and 360 degrees of the peripheral iris. This implies that any opacification obstructing laser access to part of the peripheral iris, e.g. by pterygium, still provides enough access for successful performance of ALPI. Immediate diode laser peripheral iridoplasty in conjunction with topical medications is also successful. The diode laser may be more effective at tissue penetration in the presence of a hazy cornea. ALPI is a safe and effective alternative to antiglaucoma medications for initial treatment of AAC. A randomized trial comparing ALPI and medications was performed in consecutive patients presenting with AAC and IOP >40 mmHg, who were not amenable to immediate LPI. After receiving 4% pilocarpine and 0.5% timolol in the AAC eye, the patients were randomized to immediate ALPI (33 eyes of 32 patients) or intravenous acetazolamide followed by oral acetazolamide (40 eyes of 32 patients), until IOP normalized. The latter group also received intravenous mannitol if the presenting IOP was >60 mmHg. The mean IOP in the ALPI-treated group was reduced from 60.8 ± 11.6 mmHg at presentation to 20.6 ± 10.1 mmHg one hour after ALPI. The ALPI-treated group had significantly lower IOP than the medically treated group at 15 minutes, 30 minutes, and 1 hour after initiation of treatment (Figure 2). The duration of the attack did not affect the efficacy of ALPI in reducing IOP. Longer follow up (mean 15.7 months) of these patients revealed no significant differences between the two groups in mean IOP, requirement for antiglaucoma medications, or the extent of PAS. It should be stressed that since ALPI does not eliminate pupillary block, a laser peripheral iridotomy is still required in AAC eyes once IOP is controlled and the cornea has cleared sufficiently. 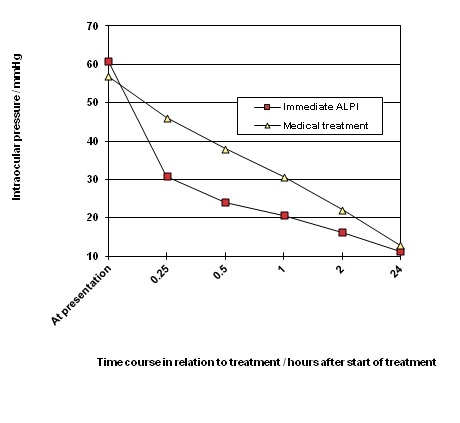 Figure 2: Randomized controlled trial comparing ALPI against conventional systemic IOP-lowering medications as first-line treatment of AAC - Profiles of mean IOP before and at various time points after commencement of treatment in the two treatment groups. Eyes with chronic angle-closure (CAC) and a combination of PAS and appositional closure can respond to ALPI with opening of the appositionally closed portions of the angle. Of 11 eyes with IOP >20 mmHg despite maximal medical therapy, all responded with initial lowering of IOP initially and 7 remained controlled at 6 months, while 4 required trabeculectomy. In a study comparing the long-term clinical course in eyes with optic nerve head and visual field damage in patients in New York and Singapore, 31.3% of the New York eyes went on to filtering surgery compared to 53.0% of the Singapore eyes. Seven eyes in the New York group underwent ALPI, after which IOPs were controlled and surgery was not required, while ALPI was not performed in the Singapore patients. If extensive PAS are present after ALPI, goniosynechialysis (GSL) may be performed, surgically stripping PAS from the angle wall to restore aqueous access to the trabecular meshwork. GSL is thought to be useful only if the PAS have been present for less than one year. Promising results have been reported in both phakic and pseudophakic eyes. It is effective both alone and in conjunction with other surgical procedures, such as cataract extraction. In eyes having had AAC with PAS, combined cataract extraction and GSL was more effective than GSL alone. It is also effective when only the inferior 180 degrees of PAS is re-opened. In one study, 13 patients with IOP >21 mmHg (30.2 ± 8.1) without medications and PAS >180° (301.8 ± 66.5) after phacoemulsification with posterior chamber intraocular lens implantation underwent GSL. At the final follow-up (27.1 ± 17.8 months) after GSL, IOP was <21 mmHg in 10 eyes (13.6 ± 2.3 mmHg) without and in 3 with medications. The mean extent of PAS in the patients with controlled IOP without medications was reduced to 78.6 ± 14.6 degrees. It was concluded that GSL further improves the success by eliminating the need for antiglaucoma medications and that performing the two procedures simultaneously should be more advantageous than performing them separately. Peripheral iridoplasty can be performed postoperatively to further flatten the peripheral iris and prevent synechial reattachment. A large or anteriorly positioned ciliary body can maintain the iris root in proximity to the trabecular meshwork, creating a configuration known as plateau iris. On gonioscopy, the iris root angulates forward and then centrally. In plateau iris syndrome, the angle remains appositionally closed or occludable following LPI. Before iridotomy, the anterior chamber is usually of medium depth and the iris surface mildly convex. If pupillary block is either not a component mechanism of the angle-closure or has been eliminated by iridotomy, physical blockage of the angle can be eliminated by ALPI, which compresses the iris root and creates a space where none was before (Figure 3). ALPI is successful long-term in eyes with plateau iris syndrome. Of 23 eyes with a mean follow-up of 79 months, the angle in 20 eyes (87.0%) remained open throughout follow-up after only one treatment. In 3 eyes, there was gradual re-closure of the angle years later, but they were readily re-opened and maintained open by a single repeat treatment. No filtration surgery was necessary in these patients during follow-up. A combined laser technique, with ALPI and sequential LPI in one sitting, has been proposed as initial treatment for eyes with plateau iris syndrome. ALPI has also been shown to be effective in opening up appositionally closed segments of the drainage angle in plateau-like iris configuration resulting from iridociliary cysts. When ALPI is used to open appositionally closed segments of the angle in the presence of a patent iridotomy, a shorter duration of angle closure prior to treatment may be associated with a higher success rate. 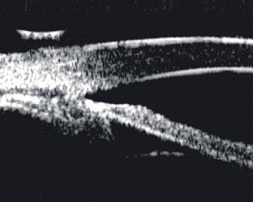 UBM image of an eye with plateau iris syndrome after laser peripheral iridotomy. UBM image of the same eye after ALPI to open the drainage angle. Angle-closure caused by an enlarged lens or pressure posterior to the lens (malignant glaucoma, aqueous misdirection, ciliary block) is not often responsive to iridotomy, although a component of pupillary block may be present and should be eliminated by iridotomy. These include such types of angle-closure as ciliary block, lens intumescence, anterior lens subluxation, or anterior lens displacement secondary to ciliary body edema from panretinal photocoagulation, scleral buckling procedures, or acquired immunodeficiency syndrome. In these situations in which the angle remains appositionally closed after LPI, the apposition can often be partially or entirely eliminated by iridoplasty. After the angle has been opened and IOP reduced, cycloplegics may be given cautiously to ascertain the mechanism of the angle-closure. Further definitive surgical intervention may be necessary after ALPI. However, in secondary malignant glaucoma, the underlying cause of the condition, such as supraciliary effusion after panretinal photocoagulation, resolves after a few weeks and observation usually suffices after ALPI and LPI have been performed. ALPI is also effective as initial treatment to break attacks of acute phacomorphic angle-closure. In a prospective case series, 10 consecutive patients with acute phacomorphic angle-closure received topical atropine (1%), timolol (0.5%), and immediate ALPI as initial treatment. After ALPI, the mean IOP was reduced from 56.1 ± 12.5 mmHg to 37.6 ± 7.5 mmHg at 30 minutes, 25.5 ± 8.7 mmHg at 120 minutes, and 13.6 ± 4.2 mmHg at one day. All 10 patients had uncomplicated cataract extraction soon after ALPI. No complications from the laser procedure were encountered. In a more recent randomized controlled trial, 10 consecutive patients with acute phacomorphic angle-closure were randomized to receive either ALPI or systemic carbonic anhydrase inhibitor as initial treatment. In this study, the ALPI-treated group took significantly less time to achieve an IOP of less than 25 mmHg (18.8 ± 7.5 minutes versus 115.0 ± 97.0 minutes, P = 0.001, F test), and had a significantly greater IOP reduction within 30 minutes (69.8% ± 7.7% versus 40.9% ± 23.9%, p = 0.03, t-test). The authors concluded that ALPI may offer greater safety, consistency, and efficacy than systemic IOP-lowering medications as initial treatment for acute phacomorphic angle closure. In acute phacomorphic angle-closure, the eye is very often severely inflamed, as these patients have usually been referred after being treated unsuccessfully for a few days. Breaking the attack with ALPI may allow a week or more for the inflammation and folds in Descemet's to clear, permitting cataract extraction under conditions much closer to ideal. Any element of pupillary block is treated with LPI as soon as possible (usually within two to three days) after breaking the attack. These patients are anatomically predisposed to angle-closure due to anterior chamber crowding. 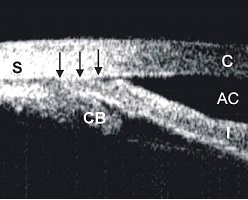 Choroidal effusions and ciliary block may occur following intraocular surgical procedures. If appositional closure persists after LPI, ALPI is indicated. Prophylactic iridotomy is not without risk. Bilateral nonrhegmatogenous retinal detachments have been described following LPI in these patients and may be attributable to worsening of preexisting retinal or choroidal disease. ALPI has been reported useful in dealing with various clinical situations, including improving visual function following multifocal intraocular lens implantation, treatment of optic obstruction in eyes with the Boston keratoprosthesis, as an adjunct to goniosynechialysis, and in angle closure associated with a cobblestone iris configuration. In AAC, moderate degrees of corneal edema are not a contraindication to ALPI. If necessary, glycerine may help clear the cornea temporarily to facilitate performing the procedure. When ALPI is used as the initial treatment in AAC, treatment to only 180º of the peripheral iris may be sufficient to abort the attack, and so obstruction to optical access to part of the peripheral iris, e.g. by pterygium, need not be a contraindication to ALPI. Corneal endothelial burns are generated by heating of the aqueous humor at the site of the laser burn and its reflux toward the corneal endothelium. If the iris is apposed to the cornea, any attempt at photocoagulation will result in damage to the corneal endothelium. If the anterior chamber is very shallow, laser applications should be timed enough apart so that heat generated can dissipate. ALPI is successful in relieving appositional closure, but not that due to PAS in eyes with uveitis, neovascular glaucoma, or the iridocorneal-endothelial (ICE) syndrome. Although ALPI has been reported to break PAS, we have been unable to accomplish this. A mild postoperative iritis is common and responds to topical steroid treatment, seldom lasting more than a few days. The patient may experience transient ocular irritation. Because iridoplasty is often performed on patients with extremely shallow peripheral anterior chambers, diffuse corneal endothelial burns may occur. As opposed to the dense white, sharply delineated burns seen during laser iridotomy, endothelial burns seen during ALPI are larger and much less opaque. If endothelial burns present a problem early in the procedure, they may be minimized by placing an initial contraction burn more centrally before placing the peripheral burn (kriss-kross iridoplasty). This first burn will deepen the anterior chamber peripheral to it, allowing the more peripheral burn to be placed with less adverse consequences. In virtually all cases, the endothelial burns disappear within several days and have not proven to be a major complication. We have seen one case of corneal decompensation following iridoplasty in a patient with preexisting Fuchs' dystrophy. Hemorrhage does not occur because of the lower power density used to produce contraction burns as opposed to destructive ones. A transient rise in IOP can occur as with other anterior segment laser procedures. Lenticular opacification has not been reported. Pigmented burn marks may develop at the sites of laser applications in some eyes treated with ALPI and are generally of no serious consequence. Iris atrophy may rarely develop, and this can be avoided by using the lowest laser power to achieve stromal contraction, and also by leaving untreated spaces between two laser application sites, and not allowing the laser marks to become confluent. When IOP is rapidly reduced in acute primary angle closure by ALPI, decompression retinopathy can rarely occur. A few patients have developed dilated pupils postlaser (Urrets-Zavalia syndrome), enough to cause photophobia and/or anxiety over the appearance or to threaten a recurrence of angle-closure. Pilocarpine 2% may be administered qhs to try to bring the pupil down. This does not necessarily work in all cases, but in all cases in our experience the pupil size has normalized, although this has occasionally taken months. If the fellow eye is felt to need ALPI and the patient is willing, we will proceed. We do not know the mechanism underlying this complication, although a similar event has been reported following peripheral retinal laser treatment. Although ALPI is highly successful long-term in eyes with plateau iris, patients need to be followed closely for recurrence of appositional closure, and if this develops, may require retreatment. Patients should be observed gonioscopically at regular intervals and further treatment given if necessary. This is most common in a patient in whom the mechanism of the glaucoma is lens-related or as the lens enlarges over time. Retreatment is only occasionally needed in patients with plateau iris, while those with intumescent lenses usually undergo cataract extraction. ALPI is a safe and simple out-patient laser procedure that effectively opens appositionally closed portions of the drainage angle. Since it does not eliminate pupillary block, laser peripheral iridotomy is still indicated if pupillary block is present. ALPI has taken on new indications in recent years. It is now a viable alternative first-line treatment for AAC, in place of systemic IOP-lowering medications. It reduces IOP more rapidly than medications. Ongoing studies will tell whether ALPI can also reduce the rate of conversion to CACG after AAC. ALPI may also have a role in the treatment of acute phacomorphic angle-closure in the future. It is essential to keep in mind that lower power, longer duration, and larger spot sizes (contraction burns) are the most effective in achieving success with this procedure. To read the full document with citations, please see the attached PDF version of the the original document provided by Dr Ritch.